Something really odd, my mom was born on Halloween and two years later so was her sister. As small children it was not the best thing to share a birthday, but now as adults they love it and both celebrate all month long. Every time October first comes around they message each other saying “happy birth month to us!” They encourage one other to spoil themselves and do something special everyday all month long, they are too funny. With my Mom’s birthday falling on this fun holiday I have started a tradition just for her. She gets a card with this adorable little ghost foot print from her grandchildren. The same card only every year the ghost get a little bigger. There is something about a child’s little foot or hand print that just makes you smile. I sure was smiling watching Maxwell help paint his sisters foot this year. Wonderful memories created and a perfect little foot print stamped forever on my moms card to make her smile year after year. 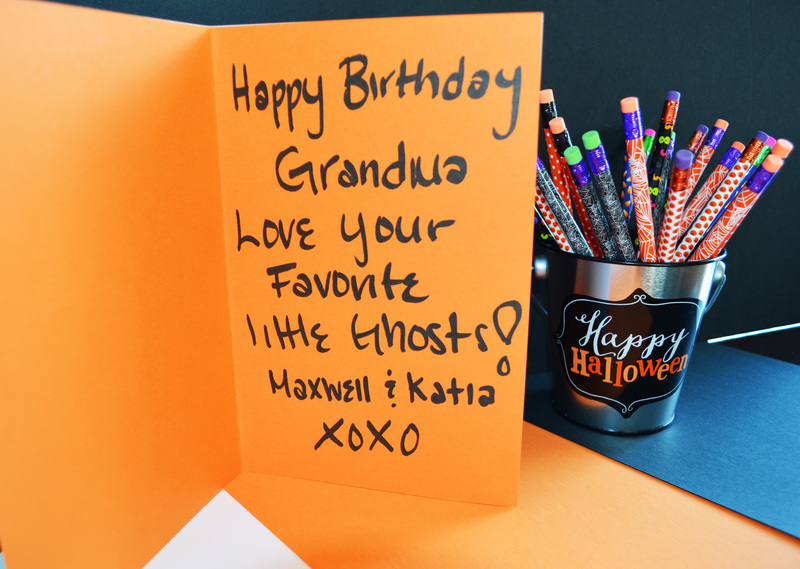 This card is a simple and creative way to say Happy Halloween or to give anyone with an October birthday. Have fun! Write "Boo" on the front of the card and inside write message "Happy Halloween...Love your favorite little Ghost or Ghosts"